Earnings season is underway, and while it’s been far from disastrous, it’s not been a cause for enormous celebration either. Goldman Sachs (NYSE:GS), J B Hunt Transport Services (NASDAQ:JBHT) and Lennar (NYSE:LEN) all three missed estimates of one form or another. They’re fairly high-profile names from a broad spectrum of industries that may portend more disappointments. Not every stock is hanging by a thread though. There are still stocks to buy that are well-positioned for market-beating growth driven by solid earnings growth. Granted, not all of these companies are media darlings or fan favorites, but that’s ok. Sometimes it’s the lesser-followed tickers that end up being most rewarding. With that as the backdrop, here’s a rundown of the top then S&P 500 stocks that offer the best chance of sidestepping an earnings-driven headwind. Some may be a bit off of the beaten path, but each of them bring better than average upside potential to the table. 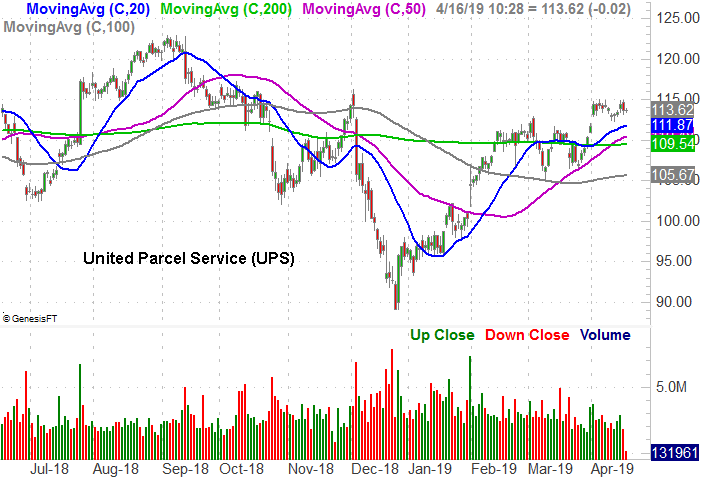 To be clear, the first quarter profit UPS (NYSE:UPS) is expected to report just a few days from now should be lower than the year-ago bottom line. Indeed, the full-year’s earnings are projected to drop as well. Between rising fuel costs, Amazon.com (NASDAQ:AMZN) starting to handle more of its own delivery work and the perception of a general economic slowdown crimping demand for shipping services, investors are understandably concerned. Those same investors, however, may have overshot their target. The pros are calling for an earnings rebound next year on the same steady sales growth UPS has consistently driven. But, at a forward-looking P/E of 13.8, UPS stock is a bargain. The clincher: Built on recently-achieved efficiencies, UPS is about to launch a major pricing overhaul that customers and non-customers should respond to. 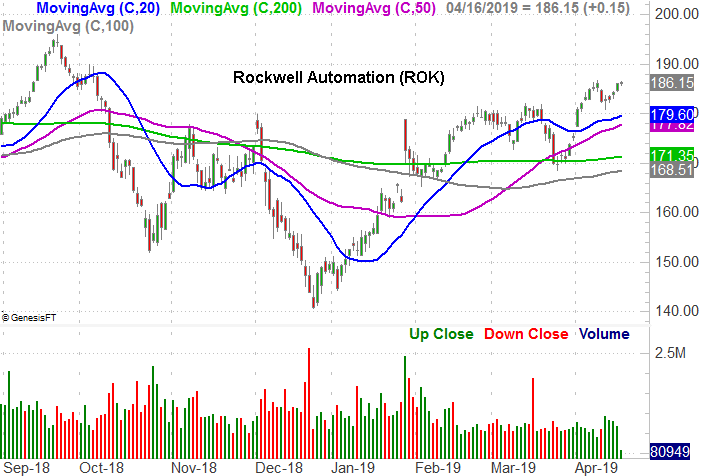 Investors looking for bargain-priced S&P 500 stocks won’t think much of Rockwell Automation (NYSE:ROK). It’s anything but cheap, looking forward or looking backward. ROK stock’s never been particularly cheap though. And it doesn’t have to be. Regardless of ratios, the market may be underestimating the company’s future. This year could prove to be pivotal one for industrial manufacturing. 5G connectivity is officially here, and factory owners are finally starting to embrace the upside of automation. It’s a trend that plays right into the hand Rockwell Automation has been holding for a while now. ROK specializes in the melding of technology, artificial intelligence, manufacturing and software. Any sort of improvement in the global trade landscape could be just the nudge Rockwell needs. HP Enterprise (NYSE:HPE) had a pretty rough 2017, and never really worked its way out of that rut. It’s not especially well-deserved weakness though. Hewlett Packard Enterprise is, of course, the business-oriented half of the split the old HP went through in late-2015. The stock got off to a good start, but investors largely viewed the institutional half of the company as missing out on the explosion of cloud computing. That’s not actually been the case though. HPE is arguably a pace-setter in hybrid cloud, with the company recently announcing partnerships with Alphabet (NASDAQ:GOOGL) division Google to simplify the use of hybrid cloud solutions. 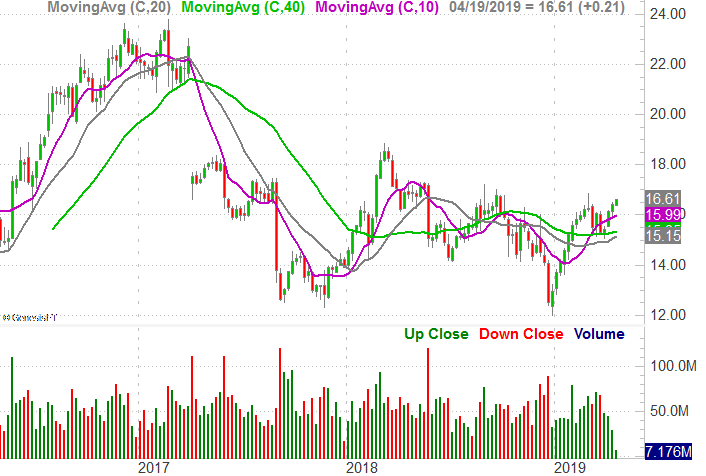 HPE stock is also priced at a very affordable 9.5x forward earnings. Don’t look now, but Kellogg (NYSE:K) shares may be on the mend after being rocked in 2018. Granted, most food stocks are doing the same. 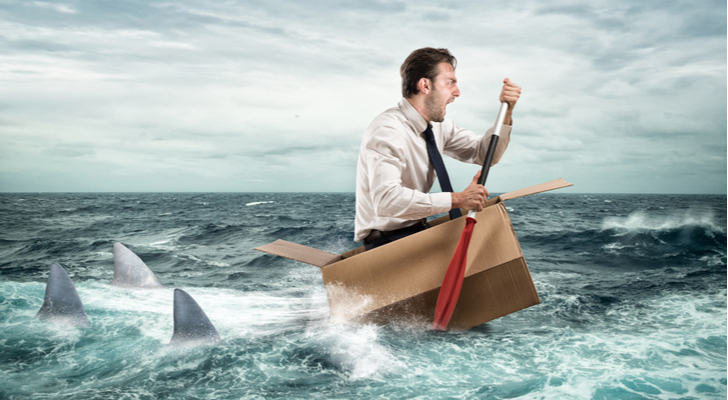 They all took big hits in 2018 on rising delivery costs as well as rising commodity costs, causing a relatively big hit to relatively thin margins. Shipping costs are still frothy, but the industry has at least gotten a grip on its inefficiencies. For Kellogg, that means shedding established brands including Keebler and Famous Amos. More important, the market is responding bullishly. 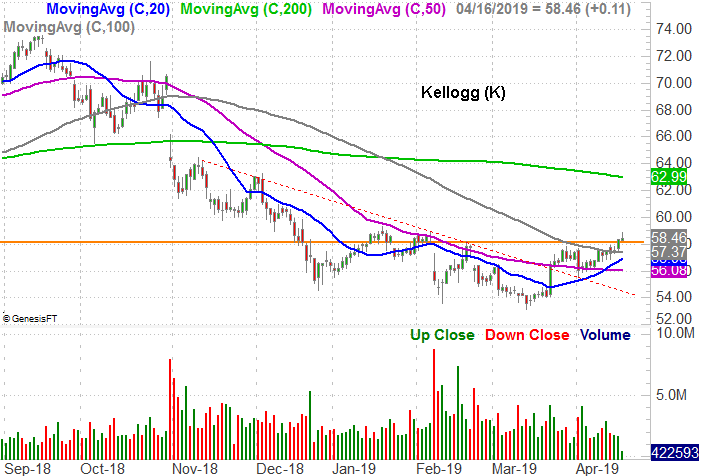 After hitting bottom in March, K stock has broken above a key falling resistance line and just this week has pushed its way above the 100-day moving average line. Yes, the so-called retail apocalypse is still in full swing, and yes, the trendy apparel sliver of the industry has been hit especially hard. Gap (NYSE:GPS) hasn’t been an exception to that norm. Gap, however, has also been hit unfairly hard. It was brutalized in 2015 when the scales really started to tip in favor of other fashion looks, and just when it looked like the worst was over in 2017, the bears growled again in 2018. The Gap, along with its other brands like Old Navy, Banana Republic and Janie and Jack, just aren’t the same draw they used to me when mall-shopping was in its prime and consumers cared about sporting a certain look. 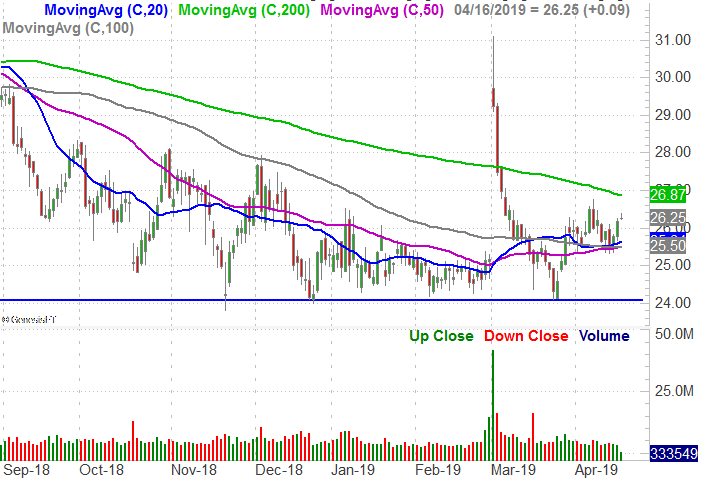 Nevertheless, GPS stock appears to have made a hard bottom at $24.00, and is not testing the waters of another rebound attempt. A better-paced move above the $200-day moving average line at $26.90 could be just the catalyst the bulls need. 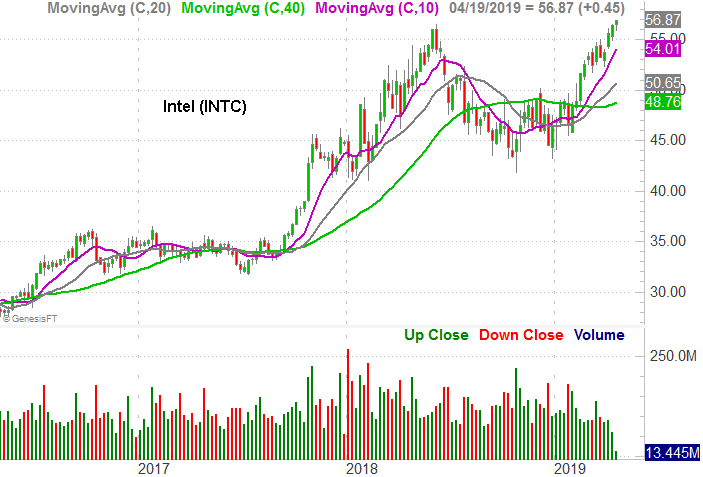 Yes, rival Advanced Micro Devices (NASDAQ:AMD) mostly caught Intel (NASDAQ:INTC) two years ago when it unveiled its Ryzen processor that matched up with Intel’s CPUs at a fraction of the cost. In the meantime, the discovery of a couple different security flaws in Intel’s chips dented the computing icon’s reputation. Rumors of Intel’s death, however, have been greatly exaggerated. Reality: Yes, Intel got lazy, and sloppy, assuming it couldn’t be dethroned. It responded to competitive threats and gaffes with full force though, and the 30% gain logged since October of last year speaks volumes about the market’s perception of that effort. As big as that gain is though, INTC stock is still cheap relative to most other S&P 500 stocks, priced at only 12 times its projected 2020 earnings. Omnicom Group (NYSE:OMC), for the unfamiliar, is a media, marketing and communications company. Specifically, Omnicom has mastered the art and science of combining online and offline efforts to maximize client sales. It’s not easy. More important, it’s a service that will only see demand grow going forward. While things should be slow this year for Omnicom, the company is expected to get back on a growth track next year. 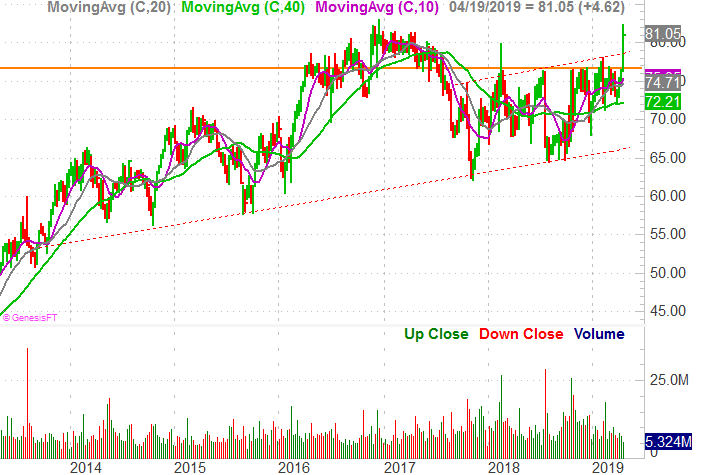 The shape of the OMC chart suggests investors are quietly maneuvering in anticipation of a breakout. They may be unconsciously planning such a breakout, in fact. The move above a couple of different technical ceilings near $78 has been a little overzealous and leaves the stock ripe for a small pullback. The bulls, however, may have just tipped their very bullish hand. 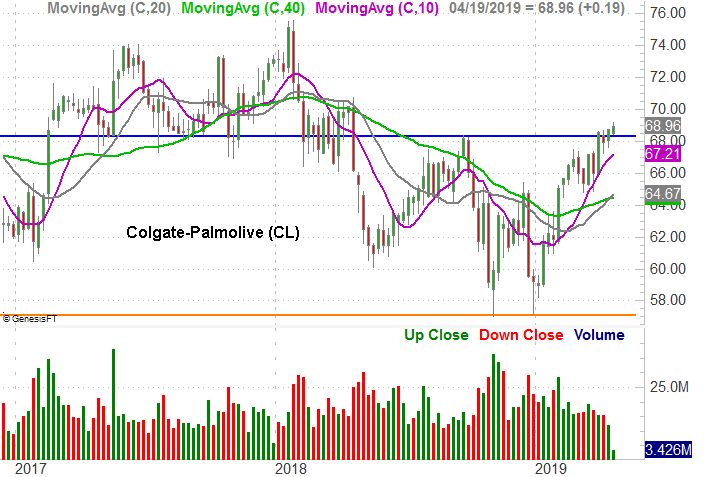 Last year was an especially tough one for Colgate-Palmolive (NYSE:CL), and by extension, for its shareholders. From high to low, CL stock fell a total of 24%, for a myriad of reasons. Broadly speaking though, its products and brands simply fell out of favor as consumers opted for alternatives. Some observers don’t expect 2019 to be any better, calling for more slowing of growth. The overall market, however, thinks differently. After making a double bottom last year around $57, CL stock has managed to fight its way above September’s high around $68.30. And, there’s still room to keep running before the early 2018 peak is challenged. There was a time not that long ago when it wasn’t clear Twitter (NYSE:TWTR) would survive, unable to turn a profit. The microblogging platform has proven those critics wrong though, swinging to a profit of 14 cents per share in 2014 and growing its bottom line almost every year since. This year’s expected bottom line is 86 cents per share, but analysts have been underestimating the company’s profits. The stock’s been rewarding too, though not as consistent. 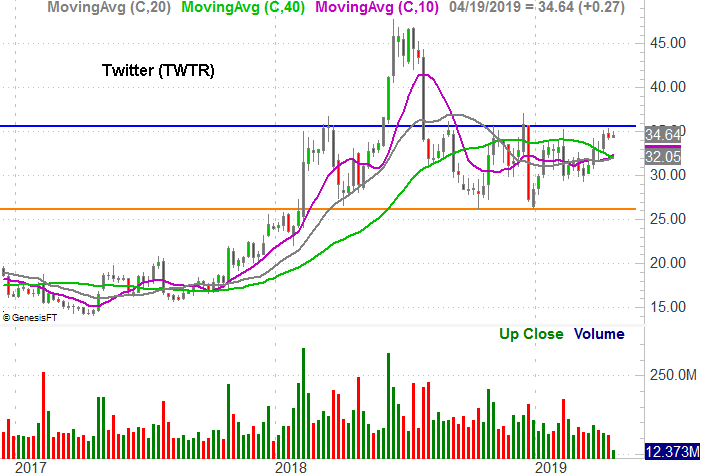 Namely, after a big rally in 2017 and early 2018, TWTR stock tumbled. Even then, however, there’s been a bullish tone evident in the aftermath. A horizontal ceiling has taken shape around $35, but after forming a bottom near $26 since October, the stock’s started to make higher lows. It appears the buyers are anticipating a breakout thrust, but are still waiting for the right catalyst. Finally, add T. Rowe Price Group (NASDAQ:TROW) to your list of S&P 500 stocks that may well shrug off earnings-minded marketwide weakness. The mutual fund company may post lethargic results this year, but investors are already looking ahead to next year’s projected revenue growth of 4.7% and earnings improving from 2019’s projection of $7.05 per share to 2020’s 7.42. The shape of the TROW stock chart confirms this optimism. 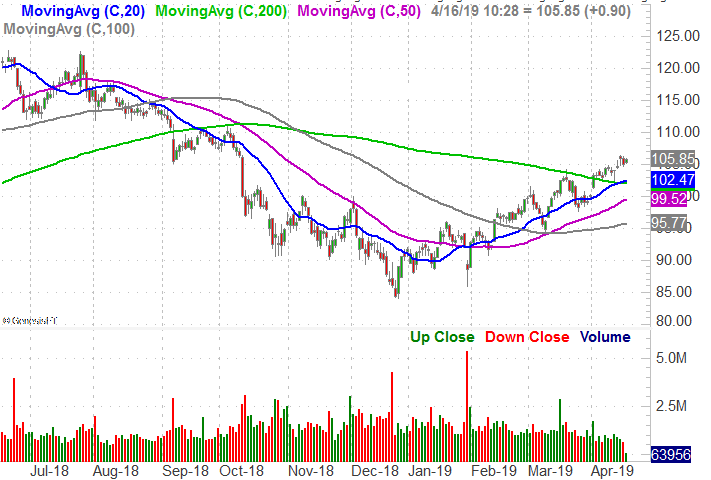 After taking on too much water in 2018, sending the stock from a high near $124 to a low near $85, investors have pushed T. Rowe shares in a straight line all the way back to $105. There’s plenty more room to reclaim, and the trend is loaded with momentum. Article printed from InvestorPlace Media, https://investorplace.com/2019/04/10-sp-500-stocks-to-weather-the-earnings-storm/.